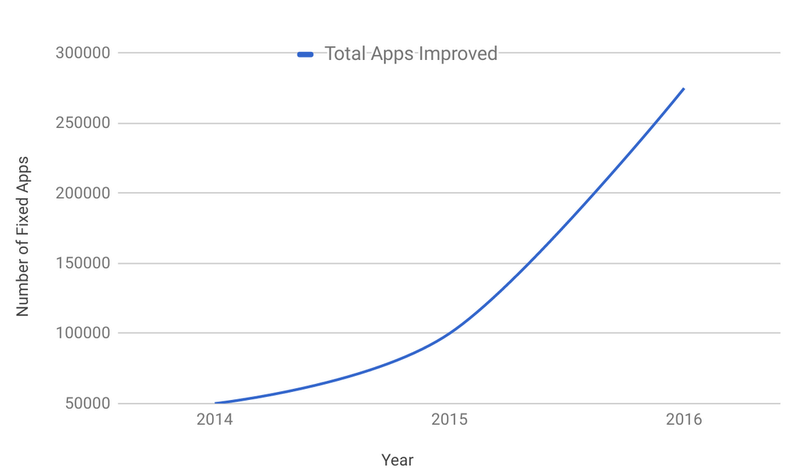 In April 2016, the Android Security team described how the Google Play App Security Improvement (ASI) program has helped developers fix security issues in 100,000 applications. Since then, we have detected and notified developers of 11 new security issues and provided developers with resources and guidance to update their apps. Because of this, over 90,000 developers have updated over 275,000 apps! ASI now notifies developers of 26 potential security issues. To make this process more transparent, we introduced a new page where developers can find information about all these security issues in one place. This page includes links to help center articles containing instructions and additional support contacts. Developers can use this page as a resource to learn about new issues and keep track of all past issues. Developers can also refer to our security best practices documents and security checklist, which are aimed at improving the understanding of general security concepts and providing examples that can help tackle app-specific issues. For feedback or questions, please reach out to us through the Google Play Developer Help Center. To report potential security issues in apps, email us at security+asi@android.com.